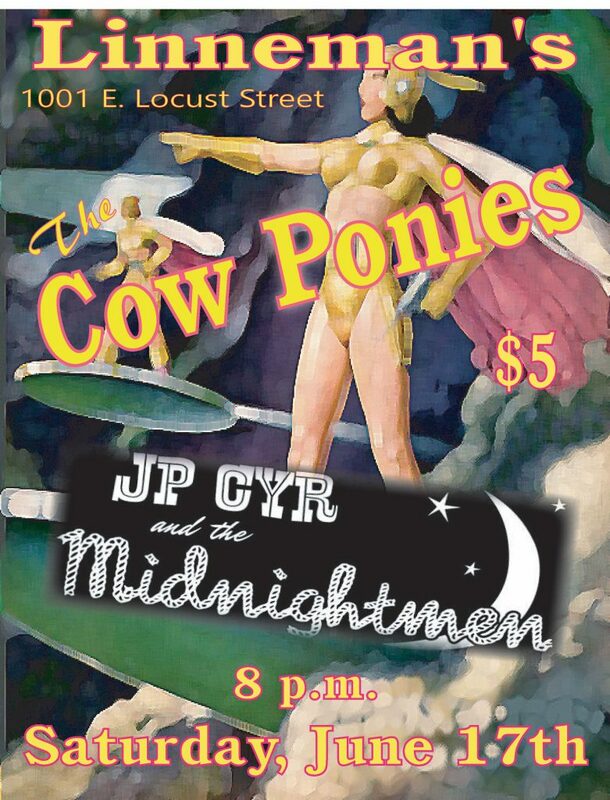 All right, so what do The Cow Ponies and JP Cyr and The Midnightmen have in common? For starters, Western shirts, Ernest Tubb covers, and pedal steel guitar! When have you ever seen two bands with pedal steel guitars back-to-back in Milwaukee? (Keith’s is a floor model; Bill’s is a console steel.) Doesn’t happen often, friends. Well, this Saturday night you’ll get yer chance, at the fabulous Linneman’s Riverwest Inn, 1001 E. Locust in the Riverwest neighborhood of Mil-town. Hillbilly, rockabilly, Western swing, alt country, old country, cow punk…all for a mere 5 bucks at the door. Come catch some fun and raucous live music before big-bad Summerfest swoops down upon the city. Show starts at 8 p.m., with JP and the boys on first until about 9:30, and John and The Cow Ponies on likely ’round 9:45 p.m. for two sets that’ll take us all right up ’til midnight. Can’t wait 2 C ya!